Dabeli which actually means pressed in Gujarati, is a simple but tasty dish which originates from Mandvi in the Kutch area of Gujarat. It goes by the name of Kutchi dabeli, desi burger, kutchi burger and has become very popular as street food in many parts of India. Its simply spicy mashed potato served in between a roll or pav along with some spicy, sweet and tangy chutneys. 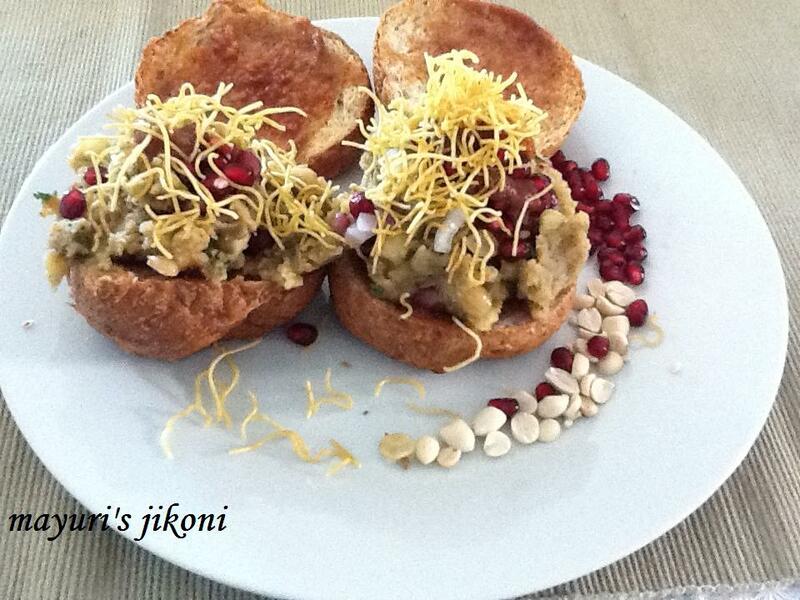 The first time I ever tasted dabeli was when our family went to Dwarka a few years ago. My son and husband refused to try it but my daughter and I did. We loved the katta meetha taste all wrapped up in a bun. Since then I have made dabeli for my daughter as she simply loves it. However, since I’ve come back to Mombasa, haven’t made it at all. Yesterday I had invited my best friend’s family over for dinner and the request was dabeli. I made dabeli after such a long time and wondered how could I have let the recipe disappear between the folds of the pages of my recipe book. Thank you Paras for bringing the recipe to “life” again. There are many ways you can serve dabeli. Lightly toast the pav or buns or leave it untoasted. Form the mashed potato into a tiny patty, or let guests help themselves. Dabeli is a great vegetarian idea for BBQ parties. Toast the buns on the grill or jiko, leave the spicy mashed potatoes in a big tawa over low heat. Let the guests put the dabeli together by themselves. One doesn’t require a plate. Take a serviette and yummy dabeli and mingle with friends. Use high starched potatoes like russets, meru potatoes for this dish. Buy ready made dabeli masala available at any indian grocery store or make your own masala at home. Heat the oil in a small pan over low heat. Add all the spices and roast it, stirring all the time till the coriander and cumin seeds begin to crackle. Take it off the heat and let it cool for a bit. Grind into a coarse powder. Add cumin seeds and asafoetida. Add the mashed potatoes, ½ cup roasted peanuts, chopped onions, dabeli masala, salt, amli, date chutney, haldi, fresh coriander and mix well. Keep the filling on the side till required or for into 12 patties. To serve, cut the buns into half, lightly butter them and toast them lightly on a tawa or under a hot grill. Spread a bit of the date and garlic chutney on the buns. Place the filling on top. Top it up with the sev, pomegranate seeds and serve. I always keep some extra roasted peanuts, pomegranate seeds and chopped onions on the side as some people may prefer more of it in their dabeli. I like to mix the pomegranate into the filling so they do not fall off when eating. If you don’t like peanuts, substitute it with roughly chopped roasted cashew nuts. Use chopped grapes or pineapple instead of pomegranate. If you find the filling too thick, add about ¼ cup water while heating it up. The filling is enough for 12 medium size buns. If you use small buns, you get more servings. A great idea to use as finger food. Adjust the amount of chutney and tamarind paste used in the filling according to your taste.